I’ve tried to figure it out…really I have. You see Frank Lake Church’s kitchen has a strange format and a tough space to figure out. Where can you put a sink? Where can you put a refrigerator? If you move this here, than where will this go? The furnace is here, the bathroom door is there, the fire exit will be here. And then I start all over again. But that hasn’t been the hardest part of the dilemma. About 4 months ago, I started thinking about a kitchen sink for the church. We looked at fabulous looking farm sinks that look like they came right from Grandpa Herbert’s farmhouse, but were really from Home Depot. But not only were they expensive, they would need a cabinet underneath. That meant…more money. Ugh. At Bible study this week, I led a study on prayer. “Pray specifically, pray often, pray in faith,” I told the women. We talked about faith and how God at times, will not answer certain prayer requests because He has something better in mind, or we must wait for what we need, for God’s timing. And I began to describe the kitchen sink I wanted. 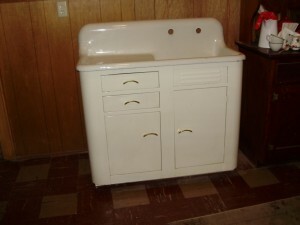 A small tin cabinet, a large porcelain sink, big and looking like it’s from Grandma’s old house (1800’s) and God would have to figure it out, because I can’t quite figure it all out and how it will work. My Bible study ladies tried to brainstorm with me, and I loved how they sat around the table with me enthusiastically over hot cups of coffee and rich chocolate brownies. I would keep praying. Farmer Dean has perused the Craigslist pages for weeks. Carpenter friend, Al, had printed out several old sinks for me, but nothing jumped off the page. Discouragement was setting in, as the kind worker-men from the neighboring town wanted to come over and hook up the kitchen sink. That’s great….if I had one. I made my list out loud at the supper table. ” Here’s what I want, Deano”….and rambled off my desires. That evening, I hit the pages of Hebrews 11 and read about faith. “Faith means abandoning all trust in our own resources, abilities and reasoning-the things we see. It means relying instead on things we cannot see-God’s promises, provisions and his concern for us. An inner attitude alone does not define faith, though. For faith to be present, action is required. Faith proves itself by its obedience to the Lord.” The Quest Study Bible NIV. I breathed my prayer before God and said, “I love You. I need a sink for the kitchen and this is what I’d like, but I need it to be affordable.” Dean passed me a check that had come in the mail for us from Grandma. I smiled and felt grateful for those who are helping us in this endeavor. And then, it happened. Dean said, “What about this, Mam?” I looked at the photo on Craigslist of the old kitchen sink. It looked like it was from Grandma’s kitchen. It sat on a small, old, tin cupboard. Perfect! It was $5.00 less than what Grandma had sent. Wow. We called. We headed to Uptown (Minneapolis) where a kind couple was remodeling one of the biggest houses Farmer Dean had ever seen. They found the old sink in the basement and said it needed a good home. It made the trip to Benson, MN, in the back of the truck, and Uncle Gary met us so that he and Deano could wrestle it into the kitchen of the church. This morning, the sun is resting on my shoulders. The blinky, twinkly, snow is radiant outside my window, and I look over at the church and smile…it has a new kitchen sink. And I begin to thank God and praise Him for being in the smallest of details and the craziest heart’s desires. Prayer….it’s an amazing thing to see God answer and be glorified in kitchen sinks and tin cabinets. He is so faithful. So, come on over you wonderful workers from Kerkhoven! We’re ready with our sink. You weren’t kidding Saturday when you said you have prayed for everything including the kitchen sink! Love this story and I am so glad I met you ladies this weekend! God is so good! Great writing as always Kathy!! !